The HEXUS Epic Giveaway keeps on giving! We're into Day 26 and WD is serving up the goodies. First prize is a My Cloud EX2 Ultra NAS, a 6TB WD Red hard disk, and a 500GB WD Black NVMe SSD! Want more? No problem. We have a 500GB WD Blue 3D SSD and a 120GB WD Green SSD for our second prize, and just because we can, we'll also gift a 120GB WD Green SSD to the third person out of our hat! The competition winner will be picked at random from all eligible entries that arrive by 09:00 London time on the closing date, January 11, 2019. First prize is a My Cloud EX2 Ultra NAS, a 6TB WD Red hard disk, and a 500GB WD Black NVMe SSD. 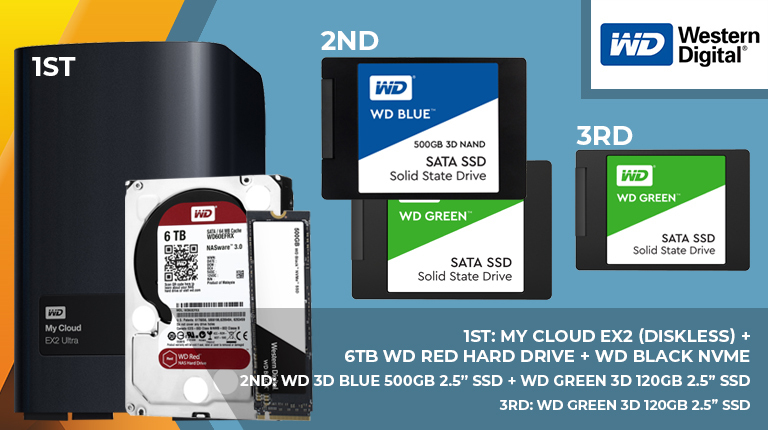 Second prize is a 500GB WD Blue 3D SSD and a 120GB WD Green SSD. Third prize is a 120GB WD Green SSD. More storage is always welcome. Very nice. Many thanks to Hexus and WD.